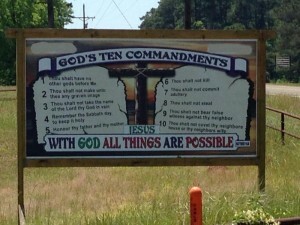 HEMPHILL, Texas — The Texas Department of Transportation (TXDOT) is ordering that a Ten Commandments sign posted on private property near a state highway be removed. Jeannette Golden of Hemphill, Texas purchased the 6 x 12-foot sign from the organization God’s Ten last summer and posted it on her property just off Highway 21. However, according to reports, Golden was soon contacted by the state, which took issue with the sign, stating that the display could be classified as commercial advertising. Golden then painted over the website on the display, but officials advised that the sign was still considered to be “outdoor advertising” and would therefore require a permit. The permit would cost $125, with an annual fee of $75 and a $250 surety bond. Fines for failure to obtain a permit are as high as $1,000 per day. However, TXDOT now states that “no permit is possible” and that the sign must be removed as pursuant to the Highway Beautification Act, which relates to advertising. Golden is insistent that her sign is not an advertisement. Local residents have rallied around Golden by purchasing a billboard not too far from her property that reads “In God We Trust.” Others have verbally expressed support for the right to display the sign. “[N]ot only has my phone been ringing off the hook, but people would see me in the community and say, ‘Don’t let that sign go down,'” she told local television station KTRE. In the meantime, Golden has enlisted the help of the Plano-based Christian legal organization The Liberty Institute. Attorney Michael Berry sent a letter to DOT officials on Thursday, asserting that the state’s actions violate the federal Religious Land Use and Institutionalized Persons Act, the U.S. Constitution and the Texas Constitution. “Such a total ban on Mrs. Golden having a sign or imposing additional restrictions is a substantial burden on her religious calling and mission of displaying the Ten Commandments in the manner she was called to do on her private property and the state has no compelling interests to support such a total bans,” the letter reads. The Liberty Institute has given the department 60 days to reply to its correspondence before it considers further legal action.